GENEVA (Reuters) – Militia violence in Democratic Republic of Congo has prevented aid workers from reaching some potential cases in an outbreak of Ebola that has so far killed 47 people, the World Health Organization said on Friday. Over 2,000 people have been potentially exposed to the virus that began in North Kivu province, but the violence means officials cannot be sure if they have identified all the chains by which it is spreading in the east of the vast country. “We don’t know if we are having all transmission chains identified. We expect to see more cases as a result of earlier infections and these infections developing into illness,” WHO spokesman Tarik Jasarevic told a news briefing in Geneva. “The worst-case scenario is that we have these security blind spots where the epidemic could take hold that we don’t know about,” he said. Congo’s Health Ministry said confirmed and probable cases numbered 87 in total, including 47 deaths. About 2,150 people have been identified as contacts of people infected with the disease, which causes fever, vomiting and diarrhea. 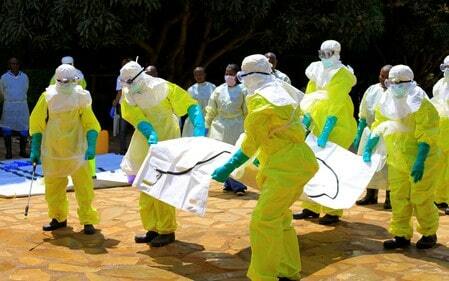 Health workers “have a huge amount of work to do to follow up on these contacts, to continue the investigations and the active search for cases, as well as to prepare the ground for the vaccination teams,” the ministry said in a statement late on Friday. The outbreak is spreading across the lush farmlands of eastern Congo. Its epicenter is the town of Mangina in North Kivu province and it has already reached neighboring Ituri province. Congo has experienced 10 Ebola outbreaks since the virus was discovered on the Ebola River in 1976, altogether killing some 900 people. An epidemic between 2013 and 2016 killed more than 11,300 people in West Africa. The United Nations children’s agency UNICEF said an unusually high proportion of the people affected in this outbreak were children. Two children have already died from the disease, and centers in Beni and Mangina were treating six children infected by the disease or suspected to be. UNICEF said it had also identified 53 orphaned children who have lost their parents to Ebola. “The impact of the disease on children is not limited to those who have been infected or suspected,” Gianfranco Rotigliano, the UNICEF representative in Congo, said in a statement. “Many children are faced with the illness or death of their parents and loved ones, while some children have lost large parts of their families and become isolated. These children urgently need our support”. The WHO said more than 500 people including health workers have been vaccinated against the disease. It had deployed more than 100 experts to Mangina and Beni towns to oversee tracing, vaccination and safe burials. There were, however, “red zones” near Mangina that aid workers could not enter for security reasons, Jasarevic said.